Russian Prime Minister Dmitry Medvedev leads a cabinet meeting, April 9, 2018. Medvedev ordered the cabinet to draw up measures to support the companies in the energy, metals and arms sectors that were sanctioned by the U.S. on April 6. Debate continues about the legality of unilateral economic sanctions. The Russian president’s spokesperson, Dmitry Peskov, said Monday that the latest U.S. sanctions against Russia are illegal, describing them as “outrageous” and saying Moscow is doing “everything necessary” to mitigate any negative impact on the Russian economy stemming from the measures. 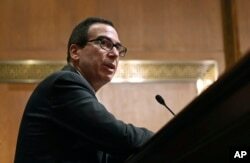 On April 6, the U.S. Treasury Department imposed the latest round of sanctions on Russia, targeting more than a dozen senior government officials, heads of companies closely tied to the Russian government, and business tycoons considered to be allies of President Vladimir Putin. The purpose is to induce a change in Russia’s foreign policy and behavior. The sanctions effectively “freeze” financial assets of the sanctioned entities on U.S. territory and ban U.S. individuals and groups from engaging in business transactions with named Russian individuals and groups. “The Russian government operates for the disproportionate benefit of oligarchs and government elites,” said U.S. Treasury Secretary Steven Mnuchin in announcing the sanctions. As a justification, Mnuchin pointed to Russia’s “malign activity around the globe,” including its occupation of Crimea and instigation of violence in Ukraine, military backing of the Syrian regime against civilians, and attempts to subvert Western democracies. “Russian oligarchs and elites who profit from this corrupt system will no longer be insulated from the consequences of their government’s destabilizing activities,” he stated. The U.S. sanctions targeted, among others, Secretary of the Russian Federation Security Council Nikolai Patrushev; Minister of Internal Affairs Vladimir Kolokoltsev; Putin’s aide Evgeniy Shkolov; aluminum tycoon Oleg Deripaska; an alleged financier close to Putin Suleiman Kerimov; top oil executives Vladimir Bogdanov and Igor Rotenberg; chairman of the investment firm Renova Group Viktor Vekselberg; chairman of Gazprom Alexei Miller; and head of state owned-VTB bank Andrei Kostin. 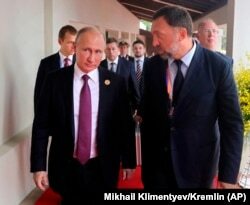 Russia's President Vladimir Putin and Russian metals magnate Oleg Deripaska walking to attend the APEC Business Advisory Council dialogue in Danang, Vietnam, November 10, 2017. Deripaska is among many other individuals targeted by the April 6 sanctions. They also targeted Deripaska’s Basic Element and EN+; the GAZ Group; Russian Machines and Renova Group; and Rosoboronexport; among other entities. A full list can be found here. Commenting on the imposed sanctions, former Acting CIA Director John McLaughlin said the sanctions “on Putin's inner circle, the dozen or so wealthy oligarchs who park money and real estate in the West” would be more costly for Russia compared to the expulsion of diplomats. 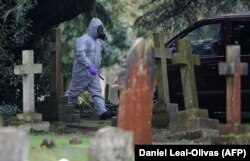 Emergency personnel wearing protective suits work at the London Road Cemetery in Salisbury, where the wife and son of former double agent Sergei Skripal are buried, March 10, 2018. The Kremlin reacted by saying the sanctions violate international law because they are unilateral and not imposed by the UN Security Council. The sanctions also targeted the assets of businessmen and officials without any court rulings. Moscow has repeatedly claimed that the sanctions Washington has imposed on Russia in recent years are illegal and unlawful. As in most legal questions, the details matter, and it appears that international law is less clear about the issue, underscoring the need for further assessment of Russia’s claims. Demonstration in support of Ukraine outside the UN during a meeting of the UN General Assembly on the question of integrity of Ukraine, New York, Mar 27, 2014. 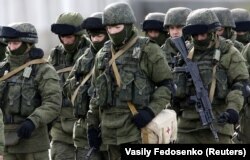 A General Assembly resolution recognized Crimea's annexation by Russia as illegal. Ruth Wedgwood, a law professor at Johns Hopkins University, told Polygraph.info that the U.S. government cannot arbitrarily target entities of a foreign government but acknowledged that suspicions of illicit activity may provide it with sufficient grounds for assets freezes. “The U.S. government is not in the habit of targeting private individuals or even the officials of a foreign government unless there is a bona fide reason to do so. But If there is reason to believe that an international transaction is illicit or otherwise criminal, such activity may lead to the temporary or permanent freezing of assets located in the United States, in order to frustrate illegal transactions,” she said. According to Pryce, the U.S. could justify sanctions as “legal countermeasures under customary international law” in response to violations of international law by Russia, which Munichin detailed in his comments announcing the sanctions. Russian servicemen walk in formation near a Ukrainian military base in Perevalnoye outside Simferopol, Crimea, Ukraine, March 6, 2014. Still, as no U.S. government evidence or comprehensive assessment on the matter is publicly available and the impact of sanctions is not easily discernable or can lend engender the scrutiny detailed above, the issue of their legality remains unclear from the standpoint of international law, which seemingly supports elements of both claims.